MAIN DECK In the stern, the garage can accommodate a Williams Sportjet 395 tender and a jet ski, which can be launched independently: a real boon for a vessel of this size. The 6m2 swimming platform is equipped with an innovative retractable ladder: during underwater movement by the swimming platform, the steps on the right become partially submerged and reveal additional steps in the upper part of the stern, providing a single, extremely convenient stairway for getting into the water and back on board. Consequently, there is no need to use the electro-hydraulic steel ladder, although it is still available. The cockpit spans more than 30m2 and boasts a new layout that enables it to be used not only for socializing or taking it easy, but also for dining. Protection is provided aft by a fixed steel and glass windscreen. The furniture comes in the shape of two large sofas that are arranged lengthwise and a low central table. The sofas can move towards the table in the middle to form a big sun pad covering approximately 6m2. The table can also serve as a dining table for up to eight people. This area was created to enhance the experience at anchor, as there are no architectural features that block direct contact with the maritime surroundings. The flybridge access staircase is recessed in the superstructure, which protects it and conceals it in side views, thus raising the standards of comfort and safety. To cater to the needs of the American market, an alternative cockpit layout has also been developed. It comes with a bar unit, two stools, two sofas and a coffee table by Paola Lenti. On the main deck, a large frame supports the superstructure and runs around the outside of the full- height glass windows. The spacious lounge covering almost 40m2 is open to the sea and reaches heights of over 2.1 m. It is furnished with two lounge chairs, an L-shaped sofa and a TV mounted in a panel with a stainless steel perimeter and mirrored surfaces. Beyond it is the dining area, with a large table and seats for eight people. A special touch is added by incorporating a panoramic balcony on each side, near the windows. Just like on large ships, the central area regulates guest and crew flows and separates their paths. On the port side is the entrance to the galley, which also has a dedicated access door on the outer walkway and stairs down to the crew area. Moving starboard, you will find the entrance to the raised helm station, which is equipped with an electro-hydraulic steering system and an integrated LOOP bridge developed in conjunction with NAVIOP-SIMRAD. 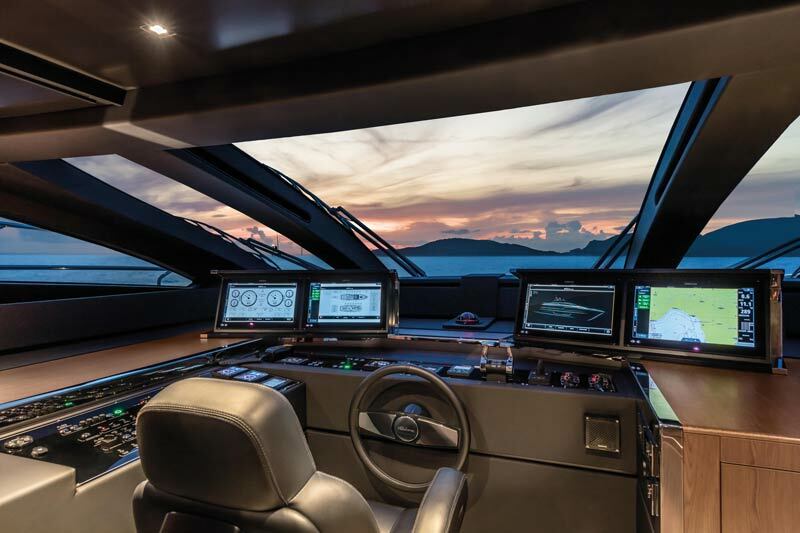 The latter features a number of 16” or 19” touch screens that encompass all of the on- board monitoring systems and navigation instruments, allowing the captain to run the entire yacht. Beyond this area is the 30 m2 full-beam master suite, with a bed in the centre, a walk-in wardrobe behind it and a large bathroom in the foredeck, at a slightly lower level. A central skylight helps to fill the suite with natural light. a second full-beam master suite that makes guests feel like real owners. Behind the bed are a walk-in wardrobe and a large bathroom that contribute to the outstanding acoustic insulation, along with the distance from the technical zones and the specially developed soundproofing. The crew area is in the foredeck of the lower deck. It contains a handy dinette and two twin cabins with bunk beds, each with its own bathroom and separate shower. FLYBRIDGE AND INFINITY DECK The vast flybridge of the new 90’ Argo spans a huge 46m2 and it comes with freestanding aft furniture. In the middle on the port side, there is a bar unit with two stools. Opposite is a dining area with an L- shaped sofa, a Corian table with a stainless steel perimeter and some chairs. On the starboard side of the foredeck, there is a retractable monkey bridge with a co-pilot’s sofa on the port side. A glass skylight in the hard top helps to increase the natural light in the area. Like the Riva 110’ Dolcevita, the 90’ Argo has an “infinity deck” with uninterrupted living areas running from the stern to the foredeck, thanks to direct connections between the flybridge, the outdoor area forward and the cockpit. 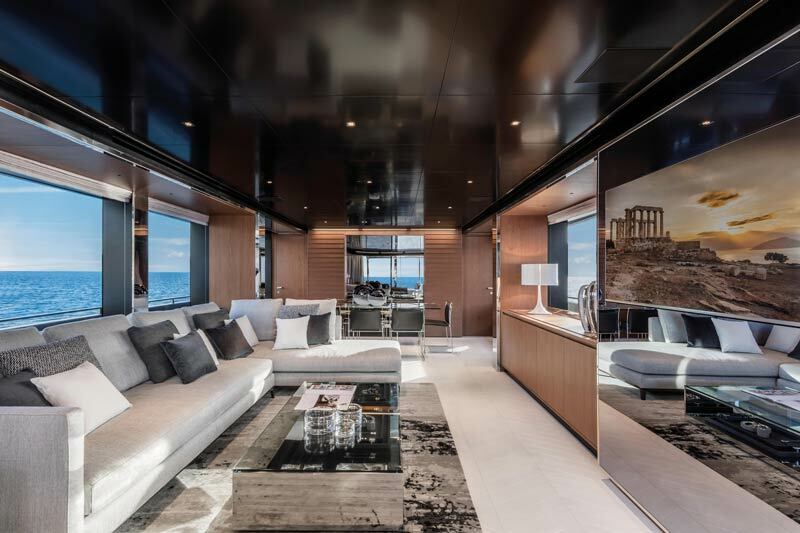 INTERIOR AND EXTERIOR DESIGN The atmosphere in the first unit is established by the classic stylistic features associated with iconic Riva elegance on both the main deck and the lower deck, with materials such as lacquer, wood, leather and steel on display. The main type of wood used is English walnut, which is the perfect match for the dark tones of the ceiling, the leather furniture coverings and the lighter hues of the parquet, fabrics, sofas and upholstery. A prominent role is also played by mirrored steel surfaces, which appear on the structural columns on the sides of the vessel, a number of items of furniture in the open space on the main deck, the stairway down to the guests’ area and the associated lobby. The interior design scheme in the lounge includes a large titanium-coloured, L-shaped Andersen sofa by Minotti, a coffee table by Acerbis, and two Rivera armchairs by Frag. Cassina black leather chairs surround a glass dining table with a chrome base by Acerbis. The blend of materials and colours on show in the lounge can also be found in the owner’s cabin and the three guest cabins. English walnut takes centre stage, along with black lacquer ceilings with white lacquer sections, and steel structural columns that create a marvellous mirror effect. Complementing all of this are the white leather covering the beds, headboard walls and bedside tables, the black leather and lacquer on the TV stand and desk/dressing table in the owner’s cabin, and the steel units with TV mirrors in the guest cabins. The furnishings are by Casamance, Penelopeoggi, RevéHome and Gentili&Mosconi. In the bathrooms, there is magnificent Calacatta Australe marble on the surfaces of the washbasins, showers and floors. 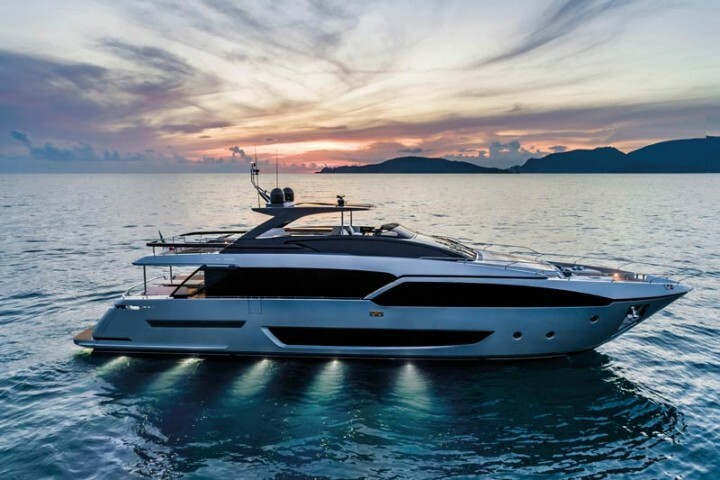 PERFORMANCE AND TECHNOLOGY In its standard configuration, the Riva 90’ comes with twin MTU 12V 2000 M96L engines with a power of 1948 MHP each. This enables it to reach a cruising speed of 22 knots and a maximum speed of 26 knots (preliminary data). Alternatively, two other types of engines are available. The first unit will be fitted with twin MTU 16V 2000 M96 engines generating 2435 MHP each. They will propel it to a cruising speed of 26 knots and a maximum speed of 30 knots (preliminary data). 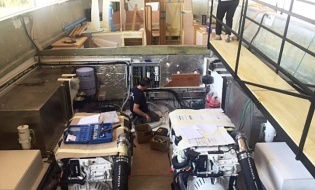 The third option is twin MTU 16V 2000 M84 engines rated at 2218 MHP, allowing the flybridge to cruise at 24 knots and attain a maximum speed of 28 knots (preliminary data). The vessel boasts two stabilizing fins and it is also possible to install Seakeeper anti-roll gyroscopes, as found on the first unit. One particularly innovative feature is Twin Disc’s E-Steer solution with Dual Bus and Speed Sensing technology: the electronic steering system uses reliable hydraulic power to control the rudders dynamically and independently. They are moved into the ideal angles at all speeds, thus maintaining speed during turns and improving handling. 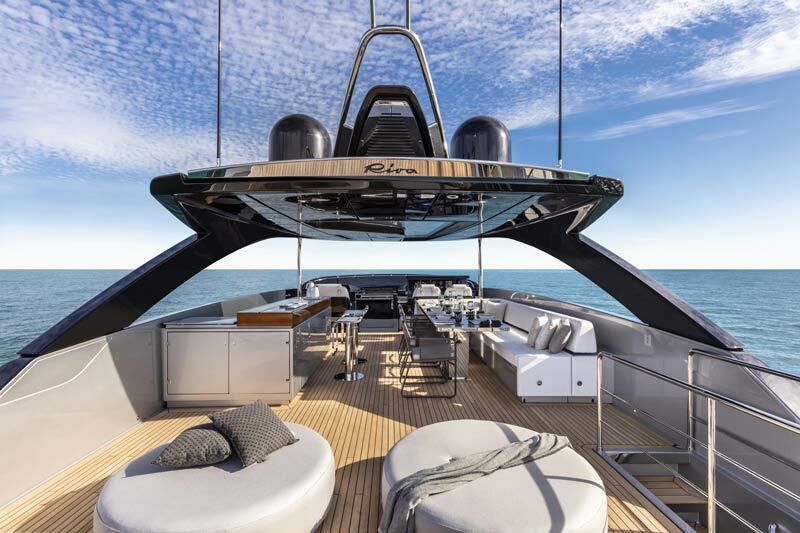 The Swan 115 represents a step forward in cruising and race design.